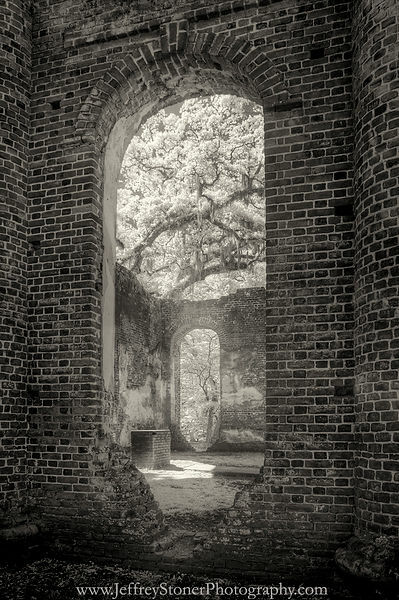 This image was made using an infrared camera...Sheldon Church, originally called Prince William Parish Church, was built of brick and tabby. The cornerstone was laid in 1751 and the church completed in 1757. ..In June 1775 thousands of pounds of gunpowder were confiscated from the British ship Little Carpenter and stored at Sheldon Church. Over the years gunpowder and weapons were regularly stored there and led to the British burning the church in 1779. Though the church burned the original walls remained. ..The church was rebuilt in 1826 but burned again in 1865 by troops under the command of General William Tecumseh Sherman during his march to the sea. Again, the walls refused to fall. 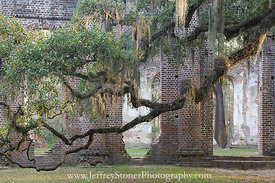 ..The original brick walls and cemetery remain and are surrounded by live oak, dogwood, magnolia and hollies. 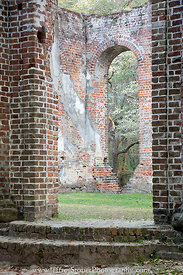 ..Sheldon Church near Beaufort SC is on the National Register of Historic Places. .